UNITED NATIONS, September 27, 2010 -- With Darfur rebel Abdel Wahid Nur living in Paris, what is France's relationship to and plans for him? 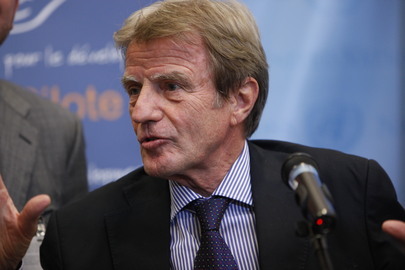 Inner City Press on Monday asked French Foreign Minister Bernard Kouchner about Nur, whom Kouchner had said would be joining the negotiation process in Doha. Kouchner shrugged that Nur had said that. Now what? Inner City Press asked Kouchner to confirm that other French diplomats have argued, that France wants to expel Nur but believes a court would on current evidence grant him asylum. These Elysee sources say that France has been seeking evidence, including through the UN, that Nur is behind recent violence in the Kalma and Zalingei IDP Camps in Darfur, as a basis to expel him. Before Kouchner could answer, his handler Monsieur Valero groaned and rolled his eyes, as if the question was forbidden. There are many causes for the violence in the camps, Kouchner finally said. Video here. One would like to better understand France's position, but the denial of access, seemingly based on the content of articles, makes it difficult. Later on Monday, Inner City Press asked the UN's top peacekeeper Alain Le Roy, a French national, about Abdul Wahid Nur. 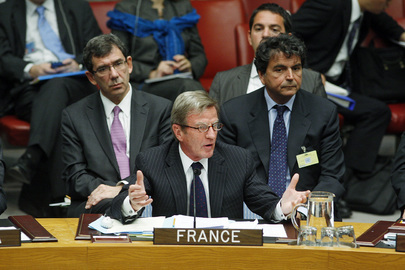 Le Roy replied much as Kouchner had: Where should Nur be sent? Inner City Press pointed out that Khalil Ibrahim of the Justice & Equality Movement is currently in Libya. Inner City Press also posed a Nur question to the UN's Ibrahim Gambari, in New York for the Tripartite Meeting with Sudan held on Monday afternoon in the UN's Conference Room 7. Gambari said there is evidence Nur -- or his supporters? -- made death threats. There is talk of a flier to this effect, which Nur has denied. The politics here seem to have Gambari, a fan of the Doha process and some say of Omar al Bashir, wanting Abdul Wahid Nur arrested or expelled from France. Obviously, someone is protecting him. Watch this site. 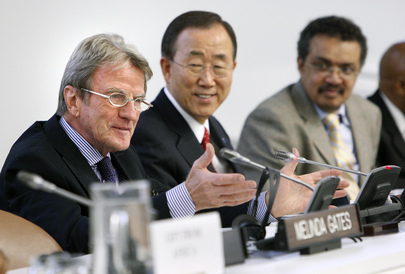 UNITED NATIONS, September 27, 2010 -- When Bernard Kouchner, for now the French Foreign Minister, did a media stakeout at the UN midday Monday, a dozen reporters showed up and fought with each other to ask questions.